Box set containing seven uniquely colored, 7 in. control vinyl records. 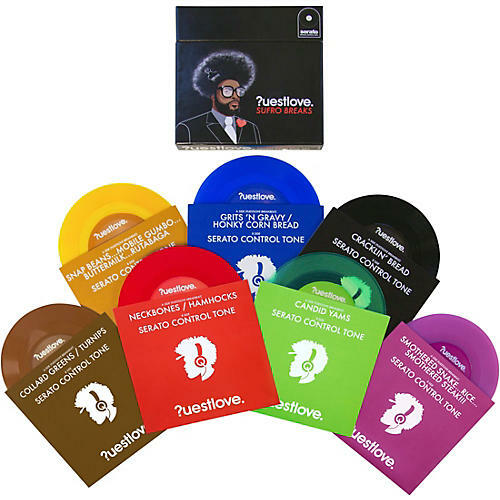 This limited-edition box set features seven colored control vinyl records, each with exclusive, royalty-free drum breaks by Grammy Award-winning artist Questlove (a.ka. ?uestlove) on one side, and Serato's proprietary NoiseMap control tone on the other. Sure to become a collector's item, this Sufro Breaks Serato pressing lets DJs spin their digital tracks on analog turntables using Serato DJ and Scratch Live, providing a more tactile experience in the modern age of digital DJing. DJs and producers alike will enjoy the back-to-basics, stripped-down raw elements that Questlove's infectious drum breaks deliver. "This is my gift; we need more drum breaks in the world," Questlove said during an interview to promote his Sufro Breaks release. "I've been making records for 20 plus years…now I want to work on my legacy." Each song is pressed on a separate 7 in. record, made of red, brown, blue, lemon-lime, lavender, gold and black-colored vinyl. Each individual record is also paired with a matching sleeve. The set's box, custom labels and sleeves all feature original artwork by Ian Hendrickson-Smith. This limited-edition pressing won't last—make sure to order your set before they're gone.